When you want enormous front suspension articulation in a high quality and high strength kit for your 2004 to 2019 F150, ICON's Uniball Upper Control Arms are your winning ticket. These control arms are built for the trail and feature an extremely strong tubular steel design paired with a uniball joint that offers a much greater range of travel for your front wheels and works extremely well with performance shocks and coilover systems. ICON's uniball upper control arm is the perfect way to get SVT Raptor-style off-road suspension performance for your very own F150. ICON builds each of the control arms in this kit out of seamless 1026 CNC mandrel-bent tubing that gives it far greater strength than your factory control arms. The control arms feature high-quality ICON Stage 2 polyurethane bushings mounted in specially-designed housings and sleeves that reduce deflection and improve responsiveness. Each control arm has a 4130 CNC machined uniball cup and 17-4 adapter pin for excellent strength and reliability in practically any application. Wheel Fitment: these control arms will fit the factory wheels and tires of your F150 and wheels 17" or larger with 5" of backspace with 33" to 35" by 12.50" tires. Note: Icon Uniball Caps are not included with these control arms. Check out our complete install guide of these ICON Uniball Upper Control Arms on our 2012 F150 5.0L FX4 Project Truck! Best product I've put on my truck yet. I was not happy with the harshness of the ride after the leveling kit but now it rides very smooth after installing these control arms. Very well made product, not hard to install. A must do on your truck if you want improve the ride and proper suspension geometry. Great product, very please and cant say enough about how great the guys at stage 3 are, I will be a long time customer. Its hard not to keep looking at new parts to buy for my truck! Installed Boss Coil Overs then added the ICON UCA's and what a difference! Uca's are made very well, and easty to install. I would recommend these if lifting truck. Couldn't be more pleased with the quality and performance of these ICON Upper Control Arms! I installed a three inch leveling kit on my truck around a year ago, but held off on the uppers. Now that I have them installed, I can truly say they make the ride much better. Allows full travel in the coil over and corrects the camber. I would highly recommend purchasing these from Stage 3! Fit and finish on the control arms is second to none, installation is very straight forward and the performance is through the roof, the front end really tightens up and the control is awesome, haven't been offroad yet but rough roads are no more on my daily drive. These Uca's were much beefier then I imagined they would be. I read a lot of reviews and watched you tube videos and nothing can describe how nice these are! 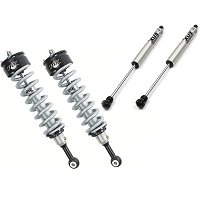 Much better then the stockers, and makes for such a tighter/solid feel in your suspension! The Icon UCAs are great - install was straightforward, quality is outstanding. Get the Icon caps immediately to keep dirt out. You'll also want an alignment right after install that'll require camber(?) shims. Stage3 was quick to ship as usual. Snagged these UCAs on cyber Monday for over $100 off! My truck has a 6in lift with bilstein front struts. These arms are extremely beefy and were easy to install. My stock UCAs were shot so decided to upgrade to these and I can say it was money well spent. Even just driving the truck fast down a rough back road it feels like it has more travel. These are a must have to pair up with a coilover/lifted strut setup. Well now I have the next best upgrade to my truck. I had installed the Boss Coilovers with stock control arms and while the ride was so much better I still had some fun and it didn't feel as good it could. Enter Icon control arms. Easy install and wow what a difference. Driving is tight but so smooth now especially with any needed articulation. 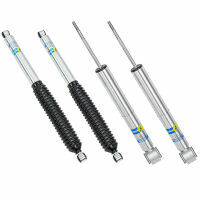 I did combine with a set of Boss rear shocks and finally I have what I was looking for. Nice kit, huge difference and eat install makes this a must have 5 star rating. Do I need a press to press the bushings and uniball into the control arms or will hand tools work? The instructions seem to skip over the how if this step. 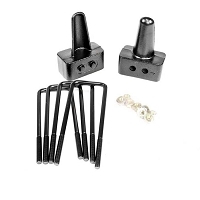 They do not need a press, you can install the uniball and pin adapter by hand. I have a '14 f150 4x4 with 35x12.50r18 goodyear mt. 's and my wheels have +18 offset, will I rub? If your wheels are 18x9" or less, then yes, you will get rubbing. With 18x9" wheels, you'll likely only rub at full lock or close to it. If you have 18x10" wheels, you should clear just fine. Keep in mind that we need both the offset and wheel width to figure out wheel backspace and fitment of various suspension parts/lift kits. Do the ICON UCA correct misalignment and put specs back to factory? Looking to order a set of 4 Fox 2.0s for my 2013 F-150 and now thinking these UCA would be a great upgrade to do at the same time. ICON's UCAs will not correct caster, camber, toe, or any other aspects of your truck's wheel alignment. They don't even really "correct" the UCA angles. ICON's upper control arms simply allow for increased travel thanks to their uniball joint versus the stock ball joint. The UCAs still pair extremely well with the Fox 2.0 Front Coilovers, however, you'll still need to go out and get an alignment after installation. Just installed a 2.5" level along with a pro comp aal on my 12' f150 eco. My current wheel/tire set up: 17x8.5 pro comp rockwells with a 0 offset and 4.75" backspacing, wrapped in 315/70r17 Duratracs. Will these fit without rubbing? Cheers! You should be okay to install these with those tires, given your backspacing. ICON recommends a a maximum of a 5" backspace to clear 35x12.50" tires. will these fit my '14 f150 4x4 that has a 4" lift and 35 12.50 tires? Fitment of these control arms is also dependent on the diameter and width of your wheels. If you're already running a 4" lift with 35x12.50" tires without any rubbing or spring contact, then you should be fine, especially if they have 5" of backspace or less. Still, it wouldn't be a terrible idea to give us a call at 1-877-578-2433 and verify that your wheels work. Alright, I have 35 12.50's on a 18x9 rim with a +18 offset, and the king oem leveling kit. will these fit? They'll technically fit just fine, however, you'll likely get at least some amount rub when turning, given your borderline levels of backspace. Thank you Jason, are there any other uniball UCA's that will fit any better? All of them offer up more or less the same fitment, given the location and size of their uniball cup versus the stock ball joint. The only odd man out is the Pro Comp UCAs, since they locate the uniball in a slightly different location than Camburg or Icon's UCAs. Wheel and tire fitment is more or less the same. In all honesty, if you were willing to drop down to a 11" wide tire or run a fairly basic set of wheel spacers, you can get these UCAs to work on your truck and its setup without rubbing. Can I tape up all the holes and use paint thinner to get the raw chromoly welds look? I wouldn't recommend it. The arms themselves are made from 1026 steel, which you really don't want top expose to the elements. The only chromoly portion is the uniball cup. Will the Icon UCA's work with a 6" BDS lift? Would the 2 aftermarket geometries align properly throughout the full range of steering & articulation? Also, what backspacing? I have 35x13.5's on 20x10 -12's. Thanks! They'll work fine with a BDS 6" lift. There's not a huge change in geometry versus the stock UCAs. The only thing ICON's UCAs will do is provide more travel than the stock UCA, however, if you're planning on getting the BDS basic kit with BDS's standard strut, then that extra level of travel likely isn't needed. You may have some rubbing issues with that wide of a tire, given that your backspace is borderline. I am currently running 18x9 with a +18mm offset with 305/60/18 terra grapplers with a rancho quicklift. Will these fit without any issues? There seems to be alot of mixed reviews about fitment on forums I look at. But no one is running that small of width of tire. Thanks for the help.